When most people think of yoga they envision a soccer mom in a yoga studio listening to soothing music. This sexually-biased thought causes many men to stray away from practicing yoga. Many people think that some exercises and sports were made only for women and other exercises, only for men. Guess what? I have some news for you. This could not be farther from the truth. Since we were children, we have been conditioned by our parents and by the environment that we live in to believe that we should think in this particular fashion because it is what we were taught. For example, girls grew up watching movies of princesses and princes while boys grew up with characters like Spiderman and Superman, competent, strong, and extremely courageous men in which, in any situation, they arose and defeated the villains easily. Although we idealize their strength, over time, we realize that it is not possible for us humans and mortals to fly or defeat fierce enemies in such a way. However, I’ve come to believe that each of us can find our own way to conquer a strong and sculpted body like these heroes. There is a growing number of men and women who spend hours and hours in gyms searching for the perfect body. In the past, let’s say 25 years’, Yoga has gained more and more momentum as an incredibly beneficial means to achieving a more perfect body. Many men still have some skepticism about this practice, since they were conditioned to think that this activity is for women only. What everyone needs to understand is that yoga does not replace the gym or any other exercise, but rather it becomes an addition to maintain good health. This is because, according to researchers, men, in late adolescence, lose their flexibility, which means that they are at a disadvantage when it comes to performing different postures or stretches when compared to women. Most men end up focusing on toning arms, shoulders and chest and ignoring lower limbs such as legs, tendons, and thighs. Yoga helps to keep your mind calm and helps energize the body, making it a great ally when it comes to performing your preferred workout or playing golf, as it helps in preparing the body for exercise, making it stronger and more flexible. The benefits of yoga go far beyond what is already known of this activity. 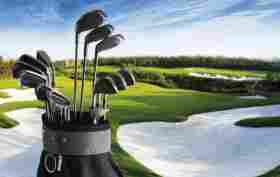 Through it is possible to seek inner peace and improve not only the quality of life but also the performance in golf. Some yoga professionals are developing yoga courses for athletes who play sports such as golf with the goal of providing practitioners a chance to stimulate their weak points on the game and also compensate for the muscular development of your sport and prevent injuries. Practices are selected according to the type of athlete and should improve flexibility and muscle tone. Other benefits of yoga for sports are balance, emotional control, increase in concentration power, ability to achieve personal goals, development of quick thinking, and self-confidence. In addition to improving physical and mental endurance. One of the biggest myths men have about performing yoga is that it is a boring practice, and it does not consume much energy. I have another news flash! It’s actually the polar opposite! Making the body and mind align is difficult, which is precisely where golf fits in the picture. Everyone knows that during a round of golf, it is necessary to align the mind and body. Through performing regular yoga, it can help beyond an individual’s imagination with this alignment. 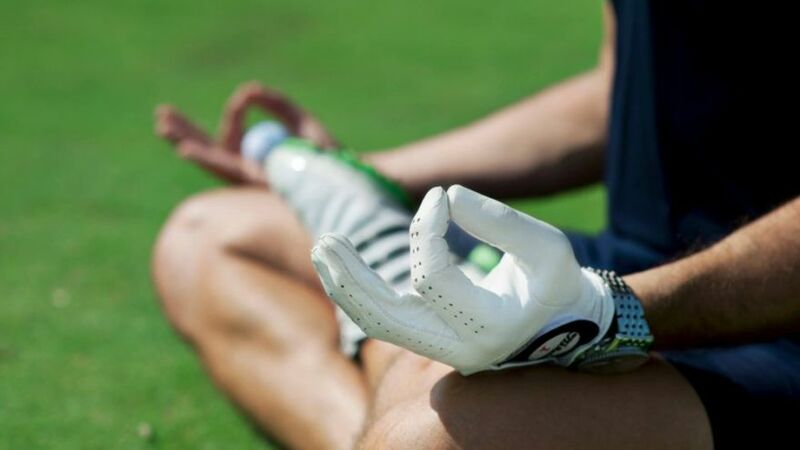 By performing yoga and becoming more in tune with the mind and body, a golfer can help face all the distractions that may appear during a round of golf. For instance, when a golfer hits a ball into the trees and must face a difficult shot, it is important to remain calm and rid the mind of frustration. Remember that yoga will not only improve your performance but combining yoga with undergoing driving range training will surely bring you great results. Golfers like Rickie Fowler, fully understand the benefits of yoga in golf. A good golfer needs a good balance and yoga will help to improve your balance. In this, I cannot stress enough how important having a good balance is during your golf swing. If you don’t have good balance your body can force you to pull shots to the right or left to compensate for the miscue. By practicing yoga stretches, you will soon notice that your tense muscles will begin to loosen, which will greatly improve your golf swing. Better flexibility allows a better range of motion and therefore you will have a stronger swing. So, if you want to maximize the range of swing movement in golf, yoga will surely help you. In this, as this practice increases the range of your movements, yoga also works to improve the flexibility of the hips and spine, the stability of the ankles and knees, and strengthens the core, arm, and hindquarters of the thighs, all of which can improve your performance in the game as a whole. Yoga uses the weight of your own body to build mass and muscle strength. Yoga allows you to gain muscle, strengthening areas of the body by performing long crunches, squats and leg presses. The results are of these exercises are stronger muscles, which help you to hit the ball with precision and strength. Practicing yoga teaches you how to understand the particular needs and limits of your body on that specific day. This ability helps you analyze and evaluate yourself, which can actually assist in reducing the risks or incidents of injuries when you are playing golf. In addition, with yoga, muscles recover quicker after physical activity. The postures performed in yoga movements include varying spinal twists so that the joints can loosen up. In this, this practice helps not only in your golf game performance but also promotes better digestion and detoxification. Additionally, it actually helps to eliminate impurities and toxins in the human body! The breathing exercises practiced in yoga will also help your focus, aligning the mind with the body, which allows you to be more focused on your golf game. So, if you are looking for a supplement to your practice of going to the driving range and playing rounds of golf, yoga may just be the natural supplement. There is a reason behind why so many fitness gurus and professional athletes promote the practice of yoga, it’s that beneficial. As time progresses, more and more studies are released that discuss and prove the benefits of yoga for the human body and mind. Given that golf is sport driven by the alignment of the body and the mind, yoga is a unique tool for golfers that can truly transform their game. As mothers typically say, you will never know until you try it.